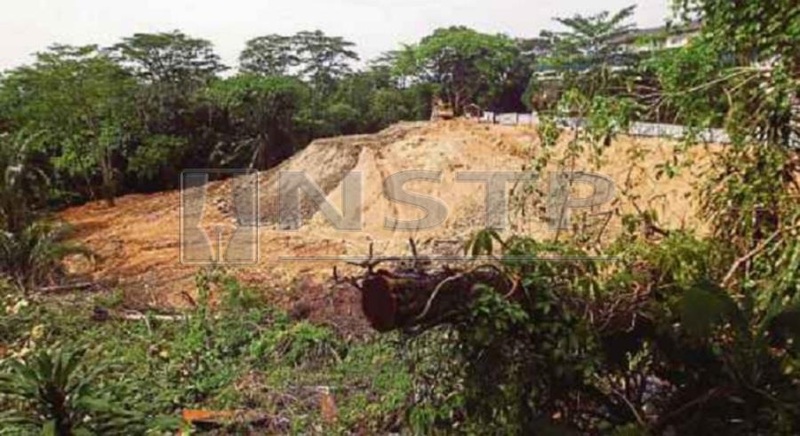 RESIDENTS in Ukay Heights are concerned about construction at a slope in Jalan Tebrau, Kuala Lumpur. They claim that it poses a threat to the environment. Lorries carrying soil to and from the site have also left cracks on the road. Resident V.C. George said the construction area was a natural rain catchment area with large trees and shrubs. “A significant amount of rainfall goes into the ravine, and excess water is channelled into Sungai Gombak through a man-made pump. work on existing monsoon drain and stabilising the slope at Lots 4796 and 4797”. “However, more trees are being felled and soil taken to the construction site. “Residents would like to know how the project was approved since the slope has a gradient of more than 45°. What we understand is that slopes above 25° are deemed sensitive and not likely to get approval for development. The New Sunday Times visited the area and found visible cracks from Jalan Page to Jalan Pakat, which are used by the lorries carrying soil for construction. NST also found a fallen tree near a house, which the residents claimed was caused by constant movement of the heavy vehicles. The fallen tree had damaged a water pipe and caused disruption. Ampang Jaya Municipal Council engineering director Zafrul Fazry Mohd Fauzi said the council had issued a stop-work order. He said the order came with conditions that the contractor must comply with, such as repairing the damaged roads, limiting the number of lorries entering and leaving the area, and following a schedule. The project had obtained approval from the council in May, when a request to restabilise and strengthen the slope was made. “It was found that the existing monsoon drain, situated along a privately owned land, was damaged and had caused more soil erosion. Zafrul said excess water was directed through a silt trap method to divert the rainwater.